LmbK described Life as Art when the first creation provided the idea for the second making life a multi-layered experience. Or walking around ALWAN 338 you might describe Life as Art. ALWAN 338 was led by one of Bahrain’s preeminent arts advocates, Bayan Al Barak Kanoo. Since 1998 she has promoted new artists and actively sought to creatively engage the community. This year in conjunction with the Spring of Culture Festival, her gallery the Al Riwaq Art Space, with the aid of government and non-government supporters, teamed up with its neighbors in the 338 restaurant block to create a community space for art. Last week my friend and I drove over to ALWAN338. As the threshold for ALWAN338, Zoe’s restaurant, got a facelift. The outside was painted a bright blue with gold, oriental-style motifs. Mercedes Gonzalez de Garay’s graphic cut-outs of old Egyptian movie stars hung between the windows. Across the street from Mirai, Scottish artist Alan Goulbourne created a wood sculpture on the plywood around the vacant lot. Late as usual, we hurried over to Al Riwaq to meet a third friend. She had already toured al mahata – the station – exhibit featuring Egyptian artist Mohamed Sharkawy. His tarbouched-figures graphically interpreted Old Cairo. Playing catch-up I dashed through the rooms. 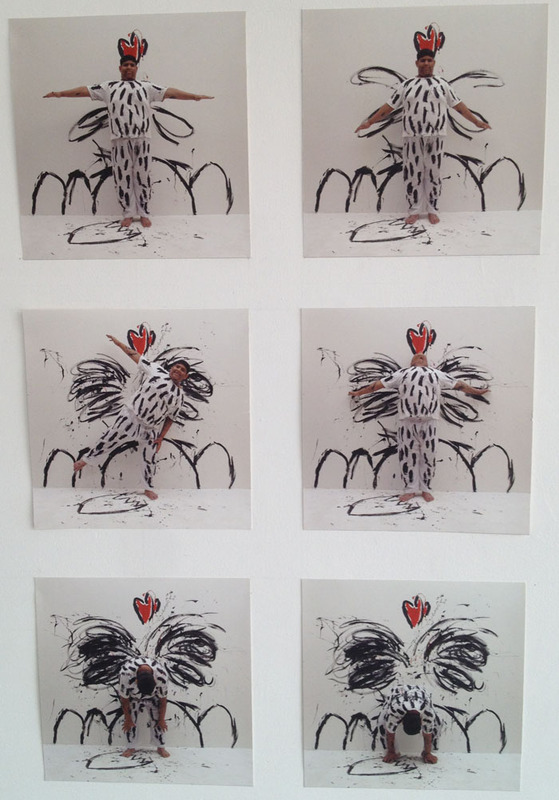 Waheedah Mallulah’s Big Rooster and the Little One, a montage of black, white and red photos of Mallulah doing yoga-for-roosters, delighted the rooster-lover in me. The gift shop was transformed into a space for Zilia Monteiro’s videography. I climbed the curved stairwell to the second floor where Sharkawy’s Egyptians continued to go about their daily business. Next to the colorful, but undifferentiated beings, a young man sat on the couch, his earphones around his neck, working on his laptop. 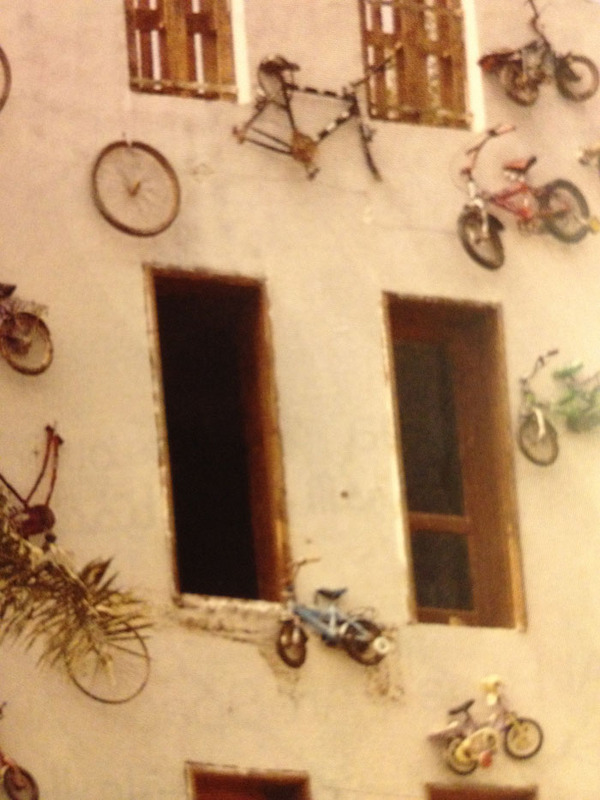 He smiled at me and asked whether or not I had seen the exhibit at Bohemia, the building encircled with flying bicycles. I told him no, but said “we were on our way over there”. I asked him if he was working. “Good luck.” We smiled at each other and said good-bye. This is a critical question in a time when the EU considers whether “to let” Turkey join their union, after France and Switzerland created legislation responding to their Muslim populations, and in the USA where mainstream Americans describe the OTHER as Teacup Conservatives, uber-rich executives or illegal alien-workers. A microcosm of global politics, Bahrain has faced its own challenges over the past year. As the diverse community members entered into the National Dialogue, the question of Who am I? Am I the OTHER? became particularly relevant. ALWAN338 gave established and emerging artists an opportunity to publicly add their distinctive “voice” to the dialogue and answer the question in their unique ways. Bahraini, Bahrain-immigrants and Arab artists of “mixed” parents presented their personal experiences as the OTHER. Being and raising third-culture children, the exhibit felt relevant to me. However, I found the most striking artists were Bahrain Contemporary Arts Association member Nader Abdulrahim, street-artist Huvil and architect Maysam Nassar. The fact that they can publicly describe their perspectives regarding truth and current social issues speaks volumes on Bahrain’s openness compared to its neighbors. 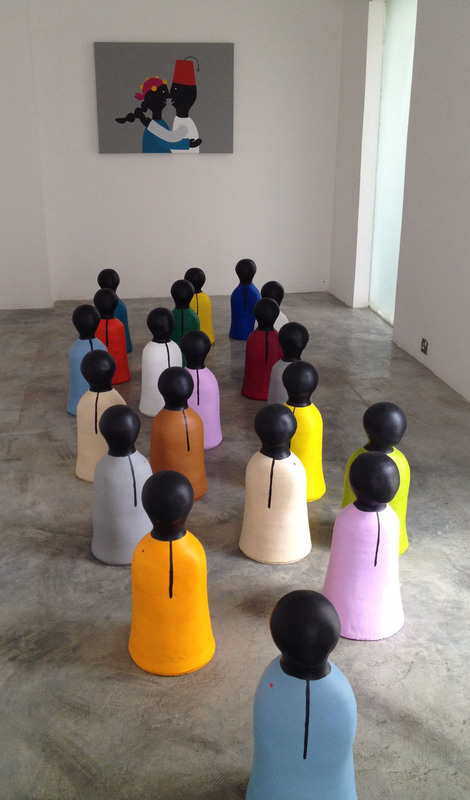 But the ALWAN338 artists are not just visual artists or limited to these two venues. DJs will be performing live at The Meat Company, an excellent place to go during this pre-summer lull in the heat. Architect Sara Kanoo created a temporary “Park”; an outdoor stage, library and cinema screen. In this under-utilized public space, films “Life in the Day” (April 10, 7:30pm) and “Man Without a Cellphone” (April 12, 7pm) will be shown; jazz-band 13th Note (April 13, 8pm) and Watan (April 20, 8pm) will perform; and several workshops for kids (Spray Painting, Cartoon Animation) and Adults (Photography, Mosaic, Street Art Intervention) will be held. My friends and I left Bohemia hoping it would become a permanent gallery and walked to Coco’s for an outdoor lunch. Coming towards us was the tall, slim man I saw earlier at Al Riwaq. Only then I knew his name. Ghalib Zuhair. 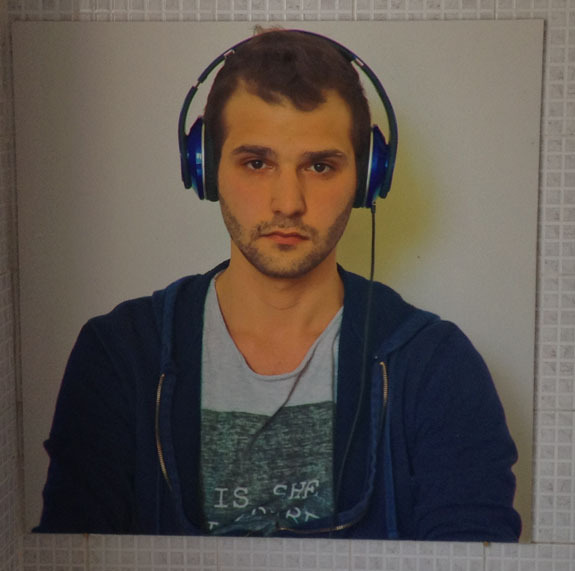 He was the Iraqi artist whose visage was featured on the I AM THE OTHER cover. According to his bio, he is looking for a place to call home. “I just saw your installation in the gallery.” Being recognized, he beamed. “How long have you been doing photography?” I asked him. That, my friends, is Life as Art. ALWAN338 continues through April 22nd from 10am-10pm. The entire schedule is on the Al Riwaq website and exhibit programs can be found at the restaurants in Adliya where the ALWAN338 flag is displayed. The restaurants that have given support and invite you to experience art-camaraderie, Bahraini-style include Blaze Burgers, Block 338, Café Italia, Mezzaluna, Tian and Masso at the Palace Hotel. In case you don’t remember Bohemia (next to the Adliya Café Lilou which for some reason is not a sponsor), you can plug this address into your GPS: Adliya, Block 338, Road 3816, Building 502. We got to see the Art in the Making then, didn’t we? They were just painting the wall blue and Goulbourne’s sculpture was still being put together when we had lunch at Cafe Lilou’s. Sorry not to see all the finished works – but then, not too sorry as I enjoy The Process as much as The End. I really did enjoy seeing the wall being painted just in the time it took for Monkeyboy to down his milkshake…in fact, now that’s a perfect image of that day: guy painting blue outlines around windows – milkshake at burlesque cafe – guy finishing up blue wall with big roller. Just another day in the Life of painter-guy, a fine bit of Art for the Others. I really love it too! I even made a short film of Maysam Nasser’s “truth” piece. 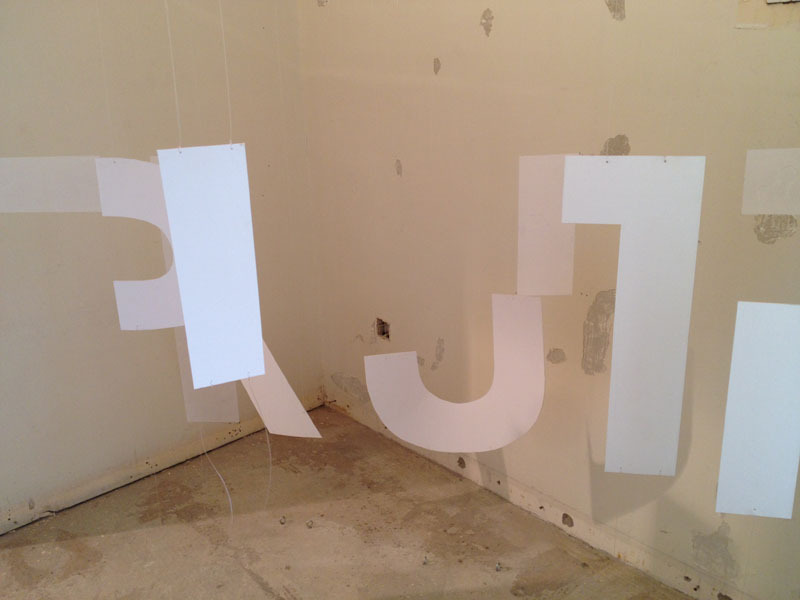 When you first look in through the door of the small room, there are some elongated white rectangles painted on the wall, and seemingly random bits of white cardboard hanging from the ceiling. But Truth is NOT like that at all! As you enter the room and your viewpoint changes, the word “Truth” beings to takes shape. Only from one corner can you see the word clearly, and when you shift your position, “truth” fragments and disappears. Very beautiful and relevant work about the ephemeral and relative qualities of that slippery concept, “truth”. And the whole park is great! I’ve spent most of the last two weeks making an 8′ X 32 foot mural out of plastic bottletops which is on display at the Pearl in Doha, and was amazed to come home to Bahrain and see this fantastic up-cycling project going on here too!